Keanu Reeves Reveals Bill & Ted 3 Plot Details. Keanu Reeves and Alex Winter return for the third film in the time travel comedy adventure. In a conversation with GQ, Reeves dropped some plot details. 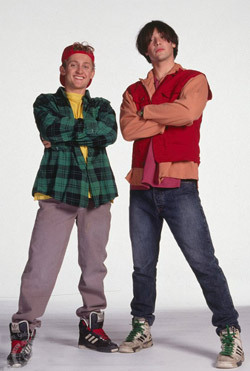 In Bill & Ted 3, adult slackers Bill Preston (Reeves) and Ted Logan (Winter) will explore alternate futures. Their lack of song writing has serious repercussions. “We go on this expedition, go into the future to find out if we wrote the song,” Reeves said. “In one version we’re in jail; in another we’re at some kind of highway motel and they hate us.” Dean Parisot (Galaxy Quest) will direct the film written by Bill & Ted’s Excellent Adventure screenwriters Chris Matheson and Ed Solomon. Adult slackers Bill S. Preston ESQ. (Keanu Reeves) and “Ted” Theodore Logan (Alex Winter) have been crushed by the responsibility of having to write the most inspirational song ever written that will change the world. To find the answers, Bill & Ted travel to the near future in order to find out if their band “Wyld Stallyns” wrote the song. In one future, that Bill and Ted refuse to tell them, and in an alternate future they blame them for not writing the song and ruining their lives. In one version they’re in jail; in another they’re living in a highway motel and they hate today’s Bill & Ted.